As I sat on the big brown sofa in Monica’s small office room I wondered what I was getting myself into. Will I remember anything? Could she make me say things I don’t want anyone to hear? Will I become a completely different person after being hypnotized? I was nervous to say the least. Monica is aware of how nervous her clients get, so she speaks with a slow and soft tone to ease the tension. She tells me to relax and breathe in very slowly until my lungs are full of air, and then release the air through the mouth. This technique is used in meditation and yoga to bring the mind to a state of complete calmness. After breathing in and out a few times I feel my body sinking down into the sofa beneath me with each exhale. I am completely relaxed. She then proceeds to hypnotize me. "As I sat on the big brown sofa in Monica’s small office room I wondered what I was getting myself into"
Before the hypnotization I begin to look around the closet-sized room that she rents in a big office building located in Regus, Florida. The walls were lightly decorated, one of them had a picture of a beach hanging on it. They were a cream color which exuded calmness and bare which exuded simplicity. Monica’s face also exuded both of these things. The second you are in her presence time just stops. I look at her as we begin the session and notice her eyes are serene. She has an olive—colored skin that glows and dark brown hair that was up at the time of our session. Before the session I had noticed she wasn’t very big. A slim figure with only about five feet of height. What she didn’t have in height she had it in her smile, which was so big she could light up a room. She had a few water bottles stacked in one corner and her paper-filled desk on the other. A small chair goes next to the desk where her clients will sit before being hypnotized. Before each session Monica interviews her clients to get a sense of who they are, where they come from, why they are there, in her office, seeking her help. She also gives a disclaimer about the therapy saying that “this isn’t a circus. I am not going to make you jump like a monkey.” She asked me about my family. I told her what I was only comfortable sharing. I did not want to give too much away as I wanted to see what she would be able to get out of me later in the session. I have never cried that much in a therapy session before. As she starts to hypnotize me, she put her hand in front of my face and started swaying it up and down, telling me to keep my eyes on her moving fingers. She then snaps her fingers and I fall in a complete trance. I was still completely aware of myself and my surroundings, I was just in a daze, completely vulnerable. I close my eyes and Monica starts to unravel the layers emotional baggage I had suppressed for so long. "I close my eyes and Monica starts to unravel the layers emotional baggage I had suppressed for so long." She asks me to think of a scenario that has brought me much pain, one that I have yet to let go of and to put myself in that scenario once again. The point of this is to go through the scenario all over again, allowing yourself to make peace with what still hurts you. I immediately think of the day my parents told me they were getting a divorce. The tears started flowing uncontrollably. She says some people scream, some cry, some laugh, some even start to act like the person Monica tells them to envision in their hypnosis. The goal of hypnotherapy, Monica says, is to dig up what is deeply rooted in your subconscious that is weighing you down without you even realizing it. What is still lingering that won't let you live in peace. You don’t even know it’s there, but you will definitely notice once it’s gone. It might have been something that happened in your childhood that scarred you, or something in a past life that remains with you. That is the case Monica’s first-ever client, Jenny, her sister. Jenny used to have very bad panic attacks where she couldn’t breathe. When Monica first got certified to be a hypnotherapist four years ago Jenny jumped at the opportunity knowing this was her chance to figure out what was going on. “We arrived in a past life and found out that the form of death was drowning. It was in a war zone, maybe in the 20’s or 40’s, and I was inside a building that collapsed,” said Jenny when she described how they got to the bottom of her breathing issues. Jenny said that after that one session she never had breathing complications again. "Jenny said that after that one session she never had breathing complications again." Jenny and Monica’s mom left Colombia and arrived at the United States 6 months before Monica decided to join them. It was the year 2000 and Monica was 26. She was just about to finish her degree in industrial design when she decided to leave Colombia because of the political climate there. Monica did not know a word of English when she got to Tampa but she quickly started working in a restaurant as a hostess. After two years of working in a different restaurant she felt confident enough to jump in the corporate world, landing a job in customer service for Verizon. She was able to finish her education in interactive media as Verizon paid for all of her student costs. She then lands a job in a health insurance company as a translations manager. She oversaw over forty-seven different languages and dialects. She says she could not handle the stress she was under. If she had continued working there, she says, she probably would have lost her life. “A lot of my co-workers started dying because of heart-attacks and things like that. The environment was extremely tense. There was no life, it was just you and your work,” said Monica. That is when she decided to make a change. Monica had been struggling her whole life with arthritis that continued to worsen she says because of her extremely stressful job. She sought to find a solution to this extremely painful condition and found bee venom. As she started being a bee-keeper she realizes that the bees were making so much honey, she could sell it. That is how Santa Monica Honey, a business she runs with her mother and sister Jenny from their home in Wesley Chapel, FL, came to be. Seeking not only to heal her physical body but her emotional one as well, she started soul-searching. She starts doing yoga, and becomes a yoga instructor. During that year, she found that what was causing the arthritis was not the stressful job, but her lack of self-forgiveness. “That hit me so hard, because I didn’t even know so many things about myself. I was self-inflicting the things in my body with negative emotions, negative thoughts, negative ideas that I didn’t even realize because I was so blind,” said Monica. That is when Monica decides to look into hypnotherapy. She recalled hypnotherapy as she was introduced to it back in Colombia when she was twelve years old because her mom heard that it helped with focusing in school. “It was really nice. You learned how to control your mental activity and you could control yourself better with going to tests. You learned how to breathe in a way that you could pretty much practice self-hypnosis to improve scores and remember things and make everything easier for you,” she said. Monica went to a school for hypnotherapy that offered the opportunity to open your own practice. She quickly started to gain a good reputation among clients and established a solid clientele. One client, Jodi Baker, cannot get enough of Monica’s extensive and intense therapeutic technique. “In the past year I would say I have gone to Monica about twenty times. I don’t think that’s usual among her other clients,” said Baker. Baker was referred to Monica by the mother of a young gymnast who had a mental block and could not get herself to tumble. Baker was seeking help for her claustrophobia because she had a terrible fear of elevators and airplanes. She then continued to see Monica for other issues she discovered along the way. “It helped dramatically. I just look at the world differently and life differently in a better way. I wasn’t aware of things that were bothering me,” said Baker. It has been a week now since I did the hypnotherapy session with Monica, and I would be lying if I said I didn’t feel different. There are really no words to describe it. I feel lighter, like something has been lifted off of me. I don’t really know what was removed from me, but clearly it was not serving me in any way. The same way Monica searched for what was causing so much pain in her life, was the way she searched for the same thing in me, and she found it. That’s what she does, she searches and searches until she finds what she’s after. She searched for a better life when she came here, she found it. She searched for a solution for her arthritis, she found it. She searched for herself, and she found herself. Ready to take your life to the next level? 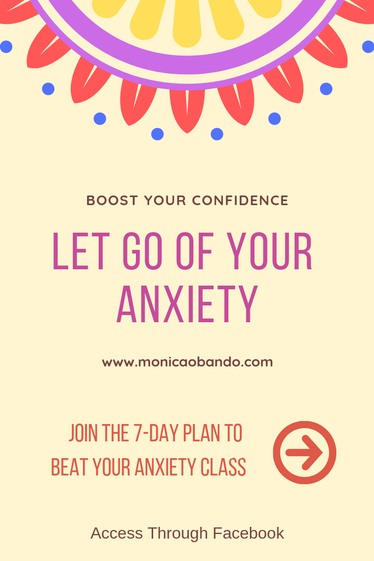 Get instant access to the 7-Day Plan to Beat Your Anxiety Class!